This sparsely branched plant is highly variable in height sometimes reaching 1 m tall; stems and leaves are covered by hairs closely adpressed to the surface. Leaves narrow 2-10 cm long. 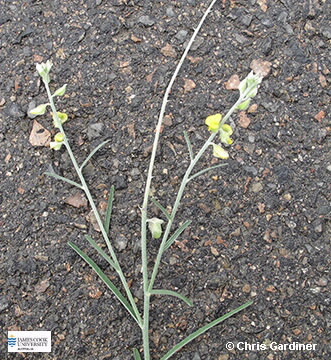 Flowers are pea=shaped and borne in a terminal raceme to 20 cm long. The standard is usually 4-7 mm long, apex is emarginate, yellow, often with marked with red streaks, the wings are yellow. The inflated pod is globular and black when ripe, it contains 6-16 dark brown seeds. This species is often confused with C. brevis which, has leaves to 2 cm long but larger flowers and the apex of the standard is not indented.